I use “throw-on-and-go” way more than I’d like to admit. But in all reality, as a new mom, it’s what I gravitate towards in most things in life. Ain’t nobody got time to waste! I am constantly adding dresses to my closet that I can just grab and put on and know I’ll look good without having to think about it. When I saw this under $50 paisley option, it was a no-brainer. The fun sleeves and grommet neckline made it interesting but the fit is insanely comfortable. I paired it with gladiator sandals and a cross-body bag (duh) for weekend errands and I got so many compliments on it while out. 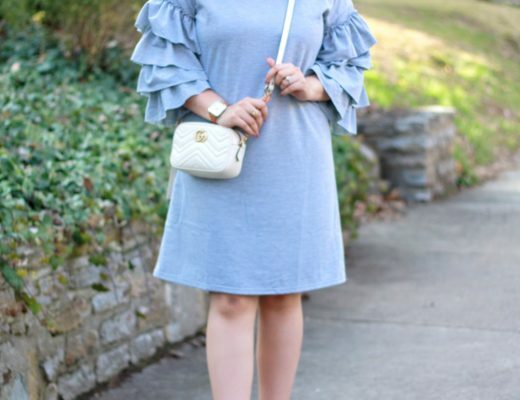 If you’re in need of some no-fuss dresses, I highly recommend this one! Thanks for stopping by! Love that dress! I feel like with the right accessories/shoes/jackets you can almost wear it year round!